If you're of age (and maybe even if you aren't), chances are you've had a crazy night where you had too much to drink, completely blacked out and was told of your wild escapades by your friends after the fact. Have I ever had an experience like this? Of course not. I'm an angel. Alcohol has never touched these lips. (I've also never cursed, lied, farted or cheated on a test.) Unfortunately, the guys in The Hangover aren't like me and they're about to have the most chaotic day of their lives. Fortunately for us, we get to come along for the ride and believe me, you won't want to miss it. Doug (Justin Bartha) is about to get married, but what type of friends would Phil (Bradley Cooper), Stu (Ed Helms) and Alan (Zach Galifianakis) be if they didn't give him one more night of freedom by throwing an outrageous bachelor party for him? And what better place to go than Vegas? So the four guys pack their bags and drive on down. Once they get there, they all gather on the roof of their hotel and take a shot to kick things off. The next thing they know, they're waking up in their hotel room with a tiger, a baby and no recollection of what happened the night before. Even worse, Doug is missing. He gets married in 24 hours, so Phil, Stu and Alan have to find him. Here's the great thing about The Hangover. It's obviously fictional, featuring a ridiculous string of events that would never happen to anyone, anywhere, at any time, but it feels realistic. Where Doug is located is the big mystery and the solution seems legit, like it could actually happen in real life. I could easily see a few guys who are completely messed up doing what they did and then forgetting about it. It takes the absurdity of the situation and makes it practical. That, in itself, is quite impressive from a narrative standpoint. Rarely has a story so preposterous felt so credible. However, what it's missing is heart. 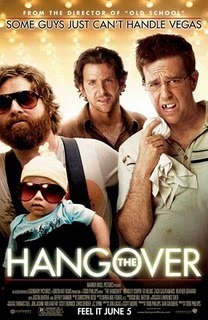 I've long said that the best comedies have emotion to them and The Hangover is sorely lacking. I never connected with the characters and I didn't care about what happened to them. Where is Doug? It hardly mattered. This movie is a nonstop onslaught of jokes, but with little to no downtime, no room was left for feeling. Most of the time, I was laughing too much to care, but the best comedies crack you up while also tugging at your heartstrings. The Hangover nailed the former, but lacked the latter. Because of the endless procession of visual gags and dirty jokes, there were moments in the movie where it would hit a standstill because it was trying too hard to be funny, as was the case with the Mike Tyson cameo, which felt forced and unneeded. It bombards you with jokes left and right, which leaves plenty of room for failure. Fortunately, more often than not, it's hilarious. Although Doug is missing most of the movie, the other three guys, played by Helms, Galifianakis and Cooper, were terrific together, with great comedic chemistry and playing off each other constantly. They produce so many laughs that you'll have a hard time breathing during certain scenes. Although they were all great, it was Galifianakis who stole the show, playing the dimwitted brother of the bride who provides some great lines that will be quoted endlessly by fans for years to come. I've purposely been a little vague in my description of the film's many traits because I dare not give anything away from this gem of a comedy. I desperately want to keep typing, detailing some of the best parts, but my elaboration would only impede your enjoyment. You know you're watching a great movie when you couldn't care less about the story, but still want to keep watching because you're curious as to what insane contingency the characters will get themselves into next. The Hangover features great performances, hysterical jokes and one of the most shocking things you've ever seen in a movie. You'll know exactly what I'm talking about when you see it. It's vulgar, offensive and crude. So yeah, I loved it.